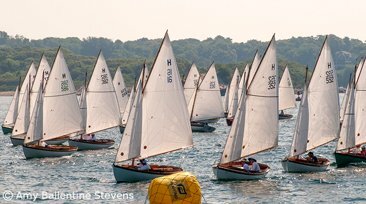 Herreshoff 12 ½ for H Class Racing! Generations of discriminating yachting families on the New England coastline have owned these boats. Many have changed hands by inheritance. 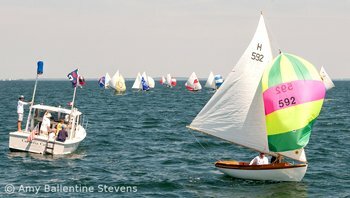 A Doughdish is ideal for beginners, for Class racing, or casual daysailing by all ages, and will be appreciated as a proper additional or replacement yacht by the old hand who finds a larger one burdensome. She is exceptionally seaworthy and capable in all kinds of weather, as comfortable to sail as a small boat can be, is surprisingly fast, and has abundant space for a crew of 4 persons. She is lovely to single-hand, and can be managed by children or great-grandmothers, yet still enjoyed by seasoned yachtsmen and women. In addition, she is distinctively charming with beautiful lines and first class construction. She turns readily and reliably, has a self-tending jib, and accommodates her crew inside the cockpit on ample seats with unobstructed legroom. The sheets are normally cleated, rather then held, as in most small sailboats. You can stand anywhere on the boat without fear of instability. It takes no time to set sail or put her to bed. The fiberglass hull is relatively easy and inexpensive to maintain and is very strong. In 1914 N.G. Herreshoff designed and built the first of several hundred 16 foot long (12 1/2' on the waterline), gaff rigged sloops, which became the H Class, usually called Herreshoff 12 1/2 footers. 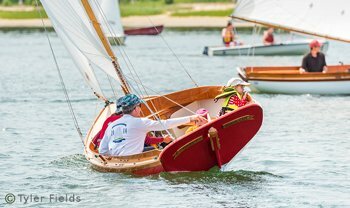 These interesting boats were originally conceived as a Buzzards Bay yacht for children, but they became a favorite of all ages and were sold all over the world. This design has long since established itself as one of the foremost examples of yachting genius, for no other type boat has acquired a more enduring popularity. The mere fact that, in 90 years, no significant modification has been made in the design testifies to its perfection. 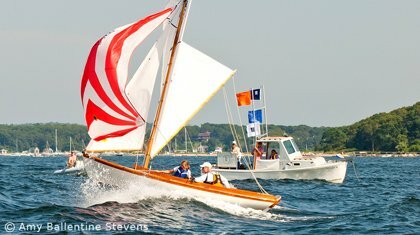 In 1943, after 29 years of production, the Herreshoff Manufacturing Co. built the 360th and final boat of their famous 12 1/2 footer class. Following World War II, 85 more boats were built, out of wood, by two other builders. After 1949-50, however, production of 12 1/2 footers ceased. By the 1970's, there still seemed to be quite a demand for these boats, especially at Yacht Clubs and areas which had maintained active fleets over some 5 decades. Yet even with a devoted following, there was no source for new boats, and the Class was sadly facing potential extinction. In 1972, William G. Harding carefully measured and took lines from some original 12 1/2 footers, lofted the lines and built the tooling (plugs and molds) for the new fiberglass Doughdish. 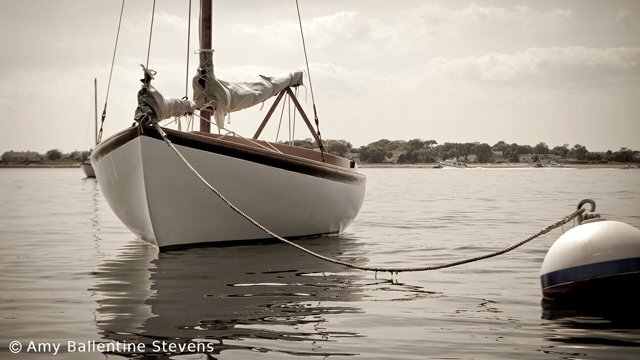 The idea was to produce boats which were identical to the Herreshoff originals, so they would be aesthetically satisfactory and, more importantly, have the same sailing qualities and performance, enabling them to compete with the wooden twelves in the H-Class. Recently, with Bill's retirement, the Doughdish production has come under the stewardship of Stephen Ballentine and his daughter Amy Ballentine Stevens. 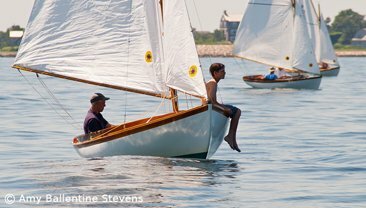 Their shop, Ballentine's Boat Shop, has been known for their work with the original Herreshoff 12 1/2 and has worked closely with Bill since the beginning of Doughdish. The name "Doughdish" originated as a nickname many years ago. It is rumored that the nickname began in the Winsor household, located at Hospital Cove in Cataumet. In addition to housing many avid 12 1/2 racers, the house overlooked where the boats would gather prior to racing. The Winsor's employed an Italian gardener who would announce "dodici, dodici!" as the boats passed by the house. "Dodici" means twelve, and apparently to the locals it sounded like "Doughdish". The boats were then often called "twelves", short for "12 1/2 footers". The name carried forth and became the name for our fiberglass version of the twelve.